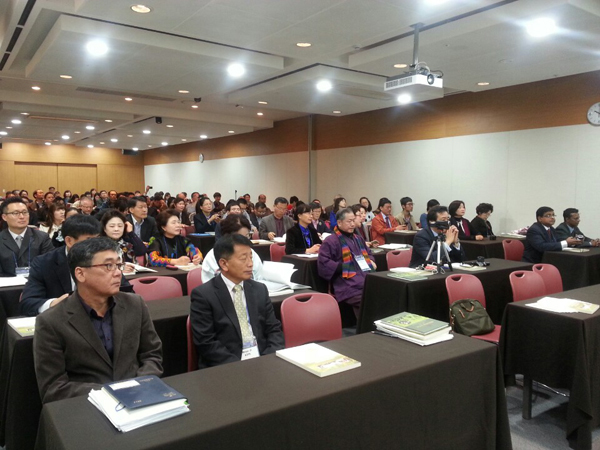 Up to 200 of the world’s great scholars participated in the Korean Tea Society’s 20th anniversary symposium. Jeju Special Self-Governing Province Agricultural Research and Extension Services and Jeju Green Tea Center held the International Symposium on Tea Science and Tea Culture 2014 from Nov. 4 to 6 at ICC Jeju. The theme this year was “the present and future of the world tea market and culture” and tea science and culture scholar joined tea-lovers from Korea, China, Taiwan, Sri Lanka, Germany and Indonesia to encounter world tea culture and increase the international tea industry. Research and ideas were shared across various fields including cultivation and production, processing, consumption, culture, and also ways to improve tea industry developement. It is three years since the last such agricultural symposium was held, the 2011 Organic Green Tea Conference and the 2011 Organic World Congress. It is also expected that Jeju green tea can spread across the nation and globe through the event.